Long ago, long before the Yi was written, when the climate in China was warmer and wetter, alligators lived in the rivers, lakes and swamps. They appeared and disappeared according to times of rain or drought. Because the seasons were rainy or dry in a quite regular yearly cycle, the alligators became associated with them - the farmers saw them as the messengers who announced the season of rain. 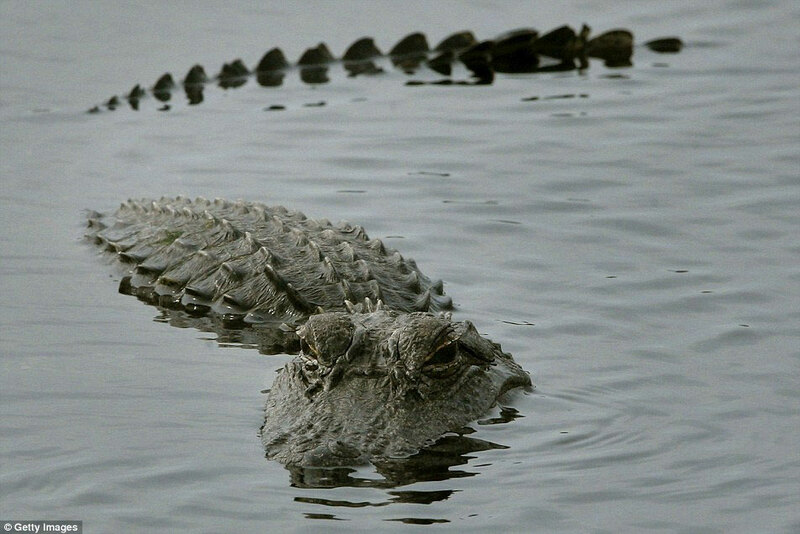 Today, there are still alligators, not many and only in the region of the Yangtze river. They are called Yangtze alligators. Sometimes whirlwinds arise above swamps or lakes, pulling up a column of water. Usually they are not big. 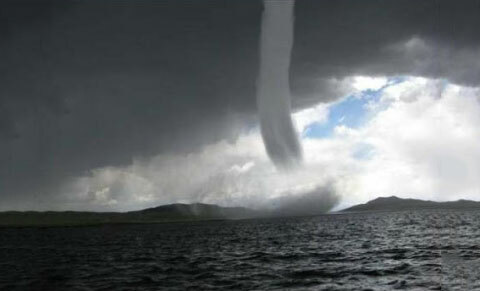 But a fullfledged tornado can not only pull up water but also quite large objects - like an alligator. 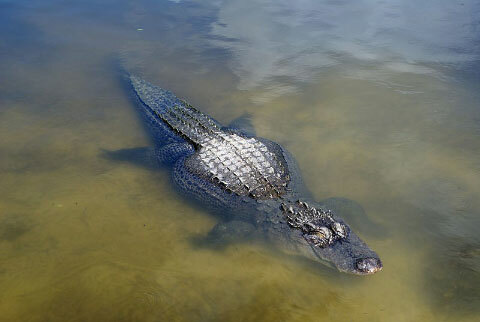 Sightings of an alligator among the water and mist must have shocked people. 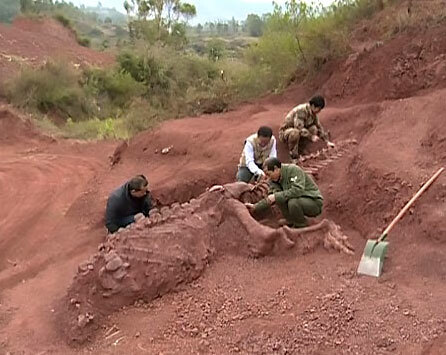 Occasionally bones, parts of skeletons and even complete dynosaurs were found. Like alligators but BIG: dragons! This one dates from 180 million years ago. It seems the Yangtze alligator is quite small and harmles. The Shuowen Jiezi dict. about long, dragon: "at autumn equinox it conceals in the watery void, at spring equinox it climbs into the sky". 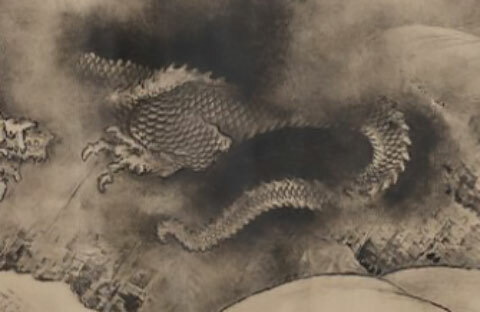 At left an old version of the character long, dragon, at right the Dragon constellation. 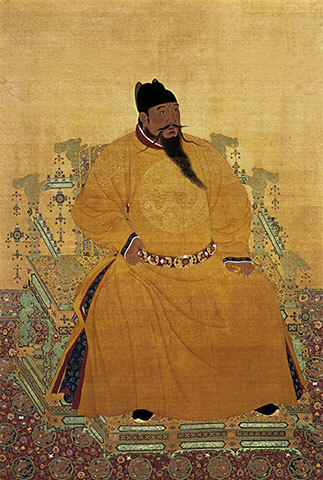 Emperor Chengzu of the Ming Dynasty, hanging scroll, ink and color on silk, 220 x 150 cm. Sitting in the dragon chair and in the dragon robe. The Chinese dragon has no wings, but it can fly, like an alligator in a tornado. The dragon lives in the water, and on the earth, and in the sky. It is often depicted in a circle - like the whirling 'flying' alligators. The image is a detail of the emperor's robe above, in greyscale for better contrast. Hex.1 line 1. Submerged dragon, no use. In winter alligators hide in burrows (not under water like this one), but the dragon is said to hibernate in the watery void under the earth. It is of no use to the farmer now. 1.2 Dragon appearing in the field. The dragon-constellation's horn (Spica) rises at dusk above the eastern horizon, accompanied by the first full moon in spring (the dragon's pearl). 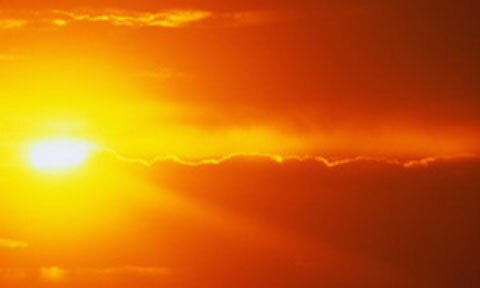 1.3 "The noble one is the whole day bright like the sun. In the evening he is alert like in danger. The dragon in the sky is halfway visible, peeking warily over the horizon. 1.4 Somehow dancing in the abyss. In the night the tail of the dragon is behind the horizon, still in the abyss. Standing on - what? 1.5 Flying dragon in heaven. At summer solstice the entire constellation stretches along the southern sky. 1.6 "Arrogant dragon (literally 'necked'). There is regret." At mid-August (in 3000 BCE) the dragon's horns and head (Libra) have disappeared beneath the horizon in the southwest. Harvest season is approaching. The dragon should accept the end of summer, not be arrogant, or he will create disorder in the lunar months and tropical year. "A flight of dragons without a head": all dragons follow the time, all in succession; nature and human affairs are in harmony. In winter the same cycle of the dragon repeats itself, but in half the time - just 4 months - and now at pre-dawn. From mid-October, when the horns appear at dawn, until spring, in the first half of Februari, at the Chinese New Year. Then the dragon, after disappearing, re-emerges again at dusk, chasing the pearl: the full moon in Aquarius. Guoyu: "when the horn appears, the rain stops". When heaven's root appears, the rivers dry up. When the base appears, the plants shed their leaves, When Quadriga (Chamber) appears, frost falls. When the Fire star appears, the clear wind forewarns of cold. So the teachings of the former kings said: "when the rain stops, clear the roads (9th month); when the rivers dry up, complete the bridges (10th month); when the plants shed their leaves, finish storing the harvest; when the frost falls, make ready the fur garments; when the clear wind comes, repair the inner and outer walls, palace and halls, prepare baskets and carts. When 'align the hall' culminates earthworks begin; when Fire star appears, assemble at the village overseer's. This is why the former kings, without employing rewards, were able to prommulgate their virtue widely throughout the world." "When 'Align the hall', a part of the dragon called "Farmer's Auspice", is upright on the meridian at dawn, the soil (its energy) emerges in pulsations." It is the beginning of the Xia calendar, about six weeks after midwinter. Yang is appearing again, yin is receding. Pankenier p.52-55 See also hex.2 the top line. The fire star (Antares) is the heart of the dragon and is also referred to as 'Great Chen'. Chen is the 5th of the 12 branches, with the meaning "seasonal markpoint" and attribute thunder. 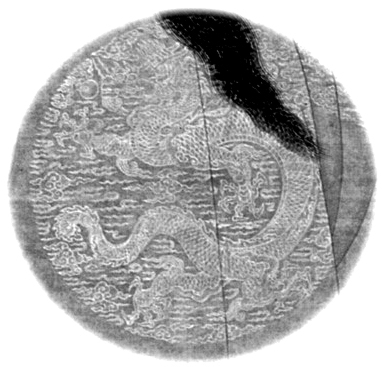 Guo Pu (276-324 CE): "The bright ones (asterisms) of the Dragon constellation serve as harbingers of the seasons, so they are said to be the Great Chen. Great Fire or Heart (Antares) is the brightest among them, so it is the chief seasonal indicator." 2.1 "Treading on hoarfrost, hard ice is arriving". Mid October the horns start to peek above the eastern horizon at the predawn hours. 2.2 "Straight, square, great. Without skills there is nothing that does not bear fruit." 2.3 "Harboring qualities permits determination. If one follows king's affairs, without achieving, he completes." Maybe "when the plants shed their leaves, finish storing the harvest"? 2.4 "Enclosed in a bag. Without fault, without praise." At autumn equinox the dragon conceals himself. Not sure if this has to do with 2.4: the sequence is not right. 2.5 "Yellow skirt. Eminent auspiciousness"
2.6 "Dragons battle in the wild". The winter dragon has not yet left entirely, but the summer dragon's horn appears at dusk. 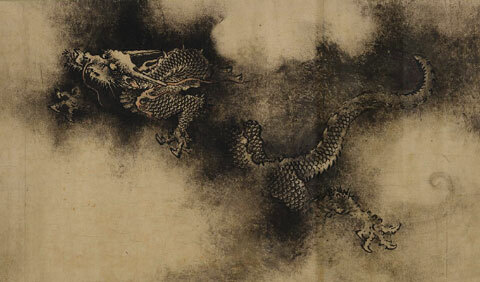 Two dragons are visible in the sky, just above the horizon. The way of the yin dragon is at its end. The dragon completed his course along the winter sky, the times are in order. A new summer season of the yang dragon can start.